Our Story - Glass 4 Classics How did it all start. Father & Son Rod and Nathan. 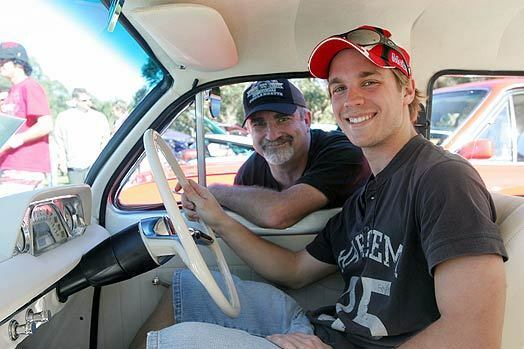 Glass 4 Classics is a family run business, founded by father and son team Rod and Nathan. It is through our love of classic cars that we have set up this business, to try and help other like-minded enthusiasts with their pride and joy. For Rod & I (Nathan) it has been over a decade since we first ventured into the Classic Car world. Having not grown up under the bonnet of a car, or under one each weekend, it was a steep learning curve. It all started back in 2003 when I, as a 15 year old, saw an old FC Holden ute for sale by the side of the road and made a passing comment to dad about perhaps doing up an ‘old car’ with him one day. With the seed planted in our minds, and with dad not needing to be asked twice, it was a matter of months and we’d found our car … An FJ Holden ute. Realising that the FJ was going to be a long term project, I (Nathan) purchased a 1964 EH Holden Sedan. As many of you would understand, this was bought to simply get in and drive. However, unable to leave well enough alone, the EH was stripped to a shell, rebuilt and tidied up. Some of you may have seen it getting around with the MY HLDN number plates. After driving it for a few years the decision was made to replace the motor and complete a full rebuild and re-spray. Almost five years later and the car is still in bare metal. (See Our Builds for the full Story). Since then, classics have come and gone through our garage doors. Some complete, others needing restoration. From Morris Minor Utes, to EJ Holden Utes, EH sedans and now our beloved Mini Cooper. We both love getting out on the road and driving the cars that we have built to enjoy. The smiles, the waves, the endless stories that people have about their own memories of these cars, it’s what makes a classic so much fun to drive! For both Rod & I there has always been something about the old cars, so why not go to work every day doing something that you love? Well, that’s exactly what we did! While sourcing glass for our own vehicles we found that there was an obvious need for glass out there. So we did what many car guys do…we started business, doing what we love, helping people with the same passion! With our extensive range of glass, we hope we can be of assistance with the pride and joy that you have in the shed or the garage!